S&P is one of the world-wide leading manufacturers of materials for the strengthening and repair of existing structures offers system solutions for the post-reinforcement of constructional elements made of concrete, wood and steel as well as bituminous pavements. S&P’s Engineering Department provides assistance in the optimum selection from the comprehensive S&P product range. The S&P FRP (Fibre Reinforcement Polymer) systems are manufactured from all types of fibres (polyester, glass, aramide, carbon, basalt). The ALPEN-MAYKESTAG group, which was founded in 1957, is based in Puch, close to Salzburg-City, Austria. With over 300 employees, the group annually produces more than 35 million quality tools at several plants in Austria. The company has two business divisions: Precision tools for trade are produced under the brand name alpen. And under the brand name MAYKESTAG, high-performance tools for industrial metal cutting are manufactured. With its own distribution companies in Germany, Italy, the Czech Republic and Hungary, as well as general agencies in over 70 countries, the ALPEN-MAYKESTAG company today is represented on every continent. The export percentage of the company amounts to over 80%. 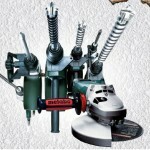 METABO manufactures tools and machines to the highest standards expected by the professional user. And that already since more than 80 years. Since that time Metabo has developed an international brand name for electrical power tools and is now represented in over 100 countries. FRIULSIDER Friulsider SpA was originally founded in 1966 as Friulsider Meccannica sas, a manufacturer of screws and bolts. Over the years, the company evolved rapidly and expanded its product range becoming one of the leading manufacturers of specialist technical fixing systems. Today, Friulsider offers a vast range of products able to satisfy and guarantee any fixing requirement. 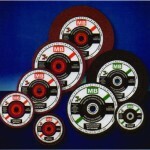 MB Resin-bonded cut-off wheel are made of selected high quality abrasives and synthetic resin reinforced by special fabics. Possessing some unique features as high tensile strength, shock strength and bending strength, they are widely used in cutting various metals or nonmetal thus achieving tasks and economical results . High speed depressive center wheels are resin-bonded abrasive tool with special fabric reinforcement mesh bearing high tensile, shock and bending strengths. By using with peripheral velocities up to 80 m/s, the wheels meet high grinding efficiency and great safety in production. To raise the strength, the wheels are reinforced with mesh fabic cloth, and the wheelbores are additionally inlaid with metal rings. The layer number of the said mesh cloth depends on the thickness of wheels.